Power Plate is the global leading vibrating platform to help you PREPARE faster, PREFORM better and RECOVER quicker. 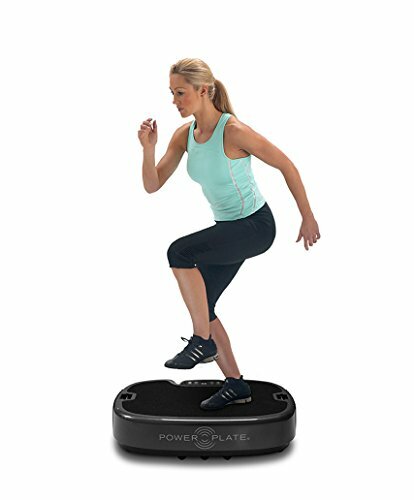 Power Plate enhances any movement, simple or complex, typically performed on the ground. Improve Core Strength, reduce the appearance of cellulite, boost endurance and energy, enhance metabolism, increase circulation and flexibility. Bringing more than 15 years’ experience in whole body vibration training, Power Plate is now available in a compact, portable version for home use. Like the professional models, this new Power Plate accelerates health and scientifically established fitness benefits to deliver faster and longer lasting results in the areas of strength training, flexibility, circulation, weight loss, cellulite reduction, and pain alleviation. Engineered to activate the body’s natural reflexive response to vibration, The Personal Power Plate’s vibrating platform moves 35 times per second to engage muscles in a safe, consistent, and controlled manner. (The vibrations move in three directions: up/down, forwards/backwards, and side-to-side.) As a result, Power Plate is able to merge low-impact training with high-performance results, enabling elite competitors, recovering individuals, and anyone seeking greater fitness levels to achieve their maximum physical potential faster and more efficiently. Improve core strength, balance and stabilityGet free video tutorials and customized Power Plate personal training workouts on the YOURTRAINER app available on IOS and Android, to get started - it's FREE!